My name is Ricardo and I am a docent for the Foster Youth Museum and our exhibit in Arkansas. This is my first trip ever outside of California and my first time flying. So far I am blown away with every aspect! I am proud to be a part of this team and to help bring the Foster Youth Museum to Arkansas. I strongly believe Foster Youth Museum helps to tell an untold story about the types of problems and experiences that are all too common in the foster care system but unknown to those on the outside. It’s been a long two days building the stands and setting up the art and artifacts donated by the youth who have been through “the system.” It has given me a new appreciation for the Museum and the youth who work hard to make their stories known. I am grateful to be a part of such an awesome team and to be able to travel—something some youth never get to do. At the time of this blog being typed I am as tired (and as happy) as a kid who’s been playing on the playground all day–we started the day with breakfast put the finishing touches on our Museum, visited the famous Crystal Bridges Museum in Bentonville and spent hours taking in the awesome art collection. We finished off with a trip to The Hive for dinner and checked out the art at the hotel/museum in the same building–what an unexpected adventure to eat with a five foot penguin sitting at our table! Arkansas has truly been an enjoyable first time out of Cali despite it being a working trip. Now I wait for tomorrow and our grand opening/reception. I’ve drawn the early shift so I’ll be there at 9 a.m. I’m excited to see the turnout and engage with the community. With that being said, it’s time to get some much needed rest for tomorrow’s big day. When I was asked to pose for a photograph about foster youth luggage, the clear plastic bags that foster youth belongings are put into when they enter and leave a placement, I was eager and happy to take part. The photo does not bring up bad foster memories for me. Unlike other foster youth, I had places with biological family where I could leave my most precious items. I did have my belongings put into plastic bags, but I learned to be detached from things while in care, because theft was so common. I kept nothing of value with me, so when I saw my clothes packed into the clear bags, it had no power over me. The strength I had as a foster kid was to accept the harsh consequences, like thievery among youth, and plan for it. What the picture means to me now, is a reminder of how many times I have moved after age 18 and after foster care. Instability is a common reason that youth enter care, and instability is a very common experience for youth after they exit care. When you see my photo in Lost Childhoods at Grace Cathedral, I want you to think about the instability foster youth experience, and I want you to know that we carry on and that we are strong. And there are ways you can support foster youth in your community. I hope to see you at Grace Cathedral, October 15 – November 1, 2015. 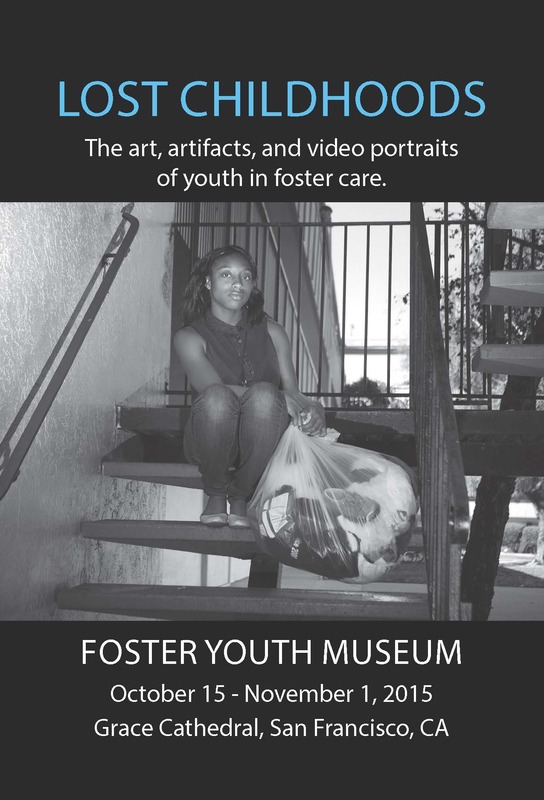 Come any day, 9 a.m. – 6 p.m.
Foster Youth Museum presents its groundbreaking exhibit about youth experiences in foster care at the historic Grace Cathedral in San Francisco. 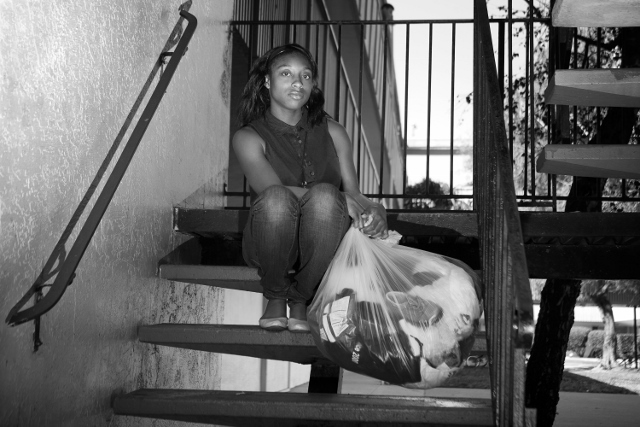 Through photos, donated objects, video portraits, and foster youth art, Lost Childhoods tells the story of loss and powerlessness – and the human capacity for resilience and connection. Foster Youth Museum was conceived by a group of former foster youth who wanted to share their experiences, so people could better understand the needs of foster youth in their community. In 2012, there were 51,800 children under the age of 18, in California, living in foster care. Approximately 4,000 foster youth “age out” of care each year with insufficient housing, support, education, wellness, and resources. Lost Childhoods is curated by Ray Bussolari and a team of exhibition collaborators, all of whom are former foster youth. The exhibit features more than 50 items, and is made possible with the generous support of Braid Mission, Grace Cathedral, the Diocese of California, Zellerbach Family Foundation, and Stuart Foundation. Grace Cathedral, 1100 California Street, San Francisco, CA, is open daily from 9 a.m. to 6 p.m. Admission is free.